As a devoted follower of all thing's Dim Sum, I am almost ashamed to admit that I have a penchant for Ping Pong, peddler of dumplings to most of London. Modelled around the concept of a 21st Century tea house, they have taken their concept and spread itself across London with great rapidity, calling no less than 12 establishments it's own. I recently received an invite to go for a paid for meal and try out their Autumn menu, and jumped at the chance. I was meeting an old friend and it seemed a good opportunity to go for tea and dumplings alongside a portion of nattering. A few emails went to and fro and I thought all was set, somewhat prematurely it seems. 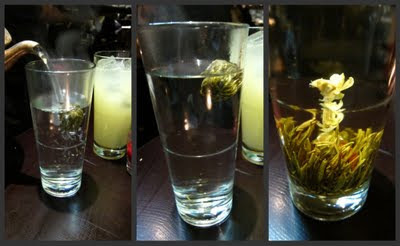 I turned up only to cause utter confusion amongst the staff. Thankfully, Godefroy (the manager) at the Soho branch was very accommodating and soon set us up with a table, and we were away. I made it my mission to try as many new dishes as possible. I am a creature of habit and always end up heading for the security of the things I know I enjoy. 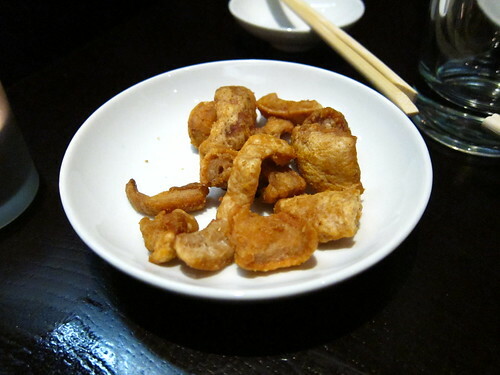 With Sichuan pork crackling (essentially spicy pork scratchings) assisting the decision making, we went down the menu and ticked more dishes than we probably should have. No sooner had we handed the waitress the menu, the dishes started arriving. 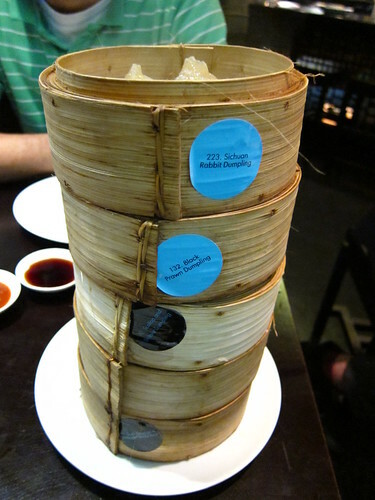 First was our tower of steamed goods. These were on the whole fairly appetising although none were really stand out. The Sichuan rabbit dumplings were moreish and lightly spiced whilst the char siu buns were actually one of the better examples I have tried recently, with light and fluffy pastry and a well balanced filling. Black prawn dumplings were an interesting combination with good garlic prawn filling, although the pastry was poor and fell apart far too easily. With regards to the "other" side of the menu, I know I said I wouldn't order stuff I always order, but I had to go for the crispy prawn balls which are my personal favourites. They certainly didn't let me down as they were well fried, with a good prawn filling. I have always liked their spring roll selection although I feel its a mistake to have removed the Jasmine chicken spring rolls, easily the tastiest alternative. I tried the black pepper and chicken chefs special and I am sorry to say, was underwhelmed with lack of filling and one dimensional flavour (pepper). Some of its dishes are seriously out of left field (the duck, orange and pineapple sticky rice is plain wrong) but on the whole, it is competently executed and well flavoured. The thing that annoys me the most about this chain is the cost. I realise that this is a modern take on a Chinese tea room, and you are paying for the ambience and setting as much as you are the food. But when I sit down for Dim Sum, I want a never ending pot of tea plonked down in front of me for little or no charge, not a glass with a fancy flowering tea for a couple of quid a go. 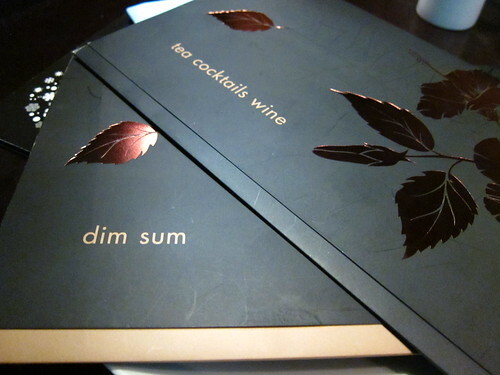 I want to be able to order as much Dim Sum as I want without overtly worrying about whether the £20 in my wallet will be enough. I want a menu where I know I won't have to face pineapple on every 2nd line. Ping Pong has it's place. The food, on the whole, is good and arrives steaming hot. What it certainly has going for it is convenience and with so many branches all over London, you are never too far away from your Dim Sum fix. A perfect place for an informal catch up, I can complain all I want with regards to it's failings but will no doubt be back soon. I have to say I'm not the biggest Ping Pong fan. Maybe it's just me and my overworked southeast Asian everything-should-be-spicy taste buds but their dimsum always (and I've been twice) tastes so bland to me! In any case, it's all good because there is always Chinatown down the street. I see ping pong as a bit of a fast food chain - I heard that they don't make any of the dumplings on site, they're brought there and then either fried or steamed. I tried that duck monstrosity too - wrongness. also got the invite, tried and was felt it wasn't quite right to bash about a freebie. chicken pineapple lemongrass dumpling was...unmentionable.glad you had a better experience! Never had the urge to try Ping Pong, and doubt I ever will after this. Duck, orange and pineapple sticky rice sounds like a foodie's nightmare. When you say you received an invite for a 'paid' review, do you mean you received money? The trouble with review meals is that there is enormous pressure to write-up an often mediocre experience. I'm always struck that often affluent people jump at these (I'm not casting aspersions on your situation, by the way). I wondered, once, whether there could be a book on eating off hospitality for a year. @catty @lizzie and @mrnoodles @wildboar - I didn't find it bland but when you are accustomed to the real thing, I guess its easy to feel disappointed. I don't really find the Chinatown joints that great either (surprisingly) although there are some great places in London as long as you are willing to make the trip. @noodlecapricciosa - I agree that if they asked you to come and you have nothing good to say about it, then you should let the PR know. I dont think it's great, but it is what it is and lots of people seem to love it! @douglas - Nope, they just comped the meal. I appreciate they are trying to get some exposure, but I would hope that they take any comments on board to try and improve their business as well. I always try to give a rounded opinion, regardless if invited or not. I realise that there appears to have been a rise in comped meals in the last year, but I truly believe that this is just because the industry is waking up to the relevance and importance of blogs and are trying to harness this for marketing, just as any evolving media would be harnessed. It all simply boils down to commercial gain.